Marvel had a great first day in the awards season race. 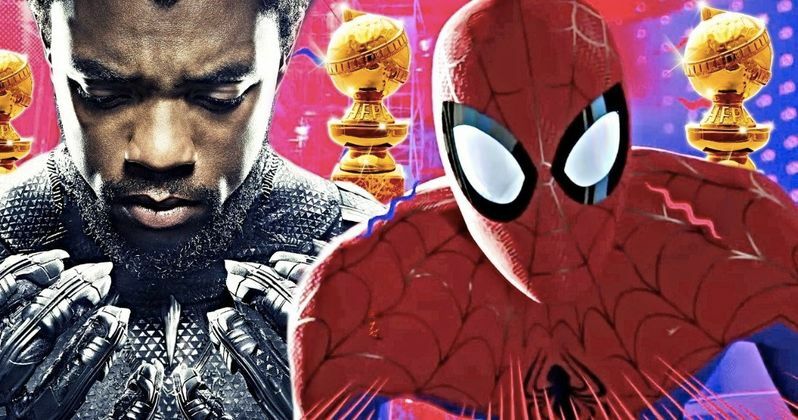 The Golden Globes nominees have been announced and both Black Panther and Spider-Man: Into the Spider-Verse came up big. Starting with Black Panther, Marvel's massive blockbuster has officially been nominated for three Golden Globe awards. Most importantly, in the Best Motion Picture - Drama category, which is something no other superhero movie has accomplished before. The studio has been campaigning hard to get Ryan Coogler's comic book adaptation a Best Picture nomination at the Academy Awards and now, it would appear that is one step closer to becoming a reality. In the category, Black Panther will be going up against director Spike Lee's BlacKkKlansman, the Queen biopic Bohemian Rhapsody, Barry Jenkins' Moonlight follow-up If Beale Street Could Talk, and Bradley Cooper's hit directorial debut A Star Is Born. It is rather interesting that the Golden Globes have a separate Best Motion Picture - Musical or Comedy category and yet, both Bohemian Rhapsody and A Star Is Born made it into the dramatic category. Granted, they're not straight-up musicals, but The Martian wasn't exactly a comedy, now was it? In any case, that Golden Globes Nominations 2019 category consists of Crazy Rich Asians, The Favourite, Green Book, Mary Poppins Returns and Vice. It's important to look at both categories. Even though Black Panther won't be going up against those musical or comedy movies directly, those are some of the movies that are likely to make into the Oscars Best Picture list this year. Another thing worth pointing out is that Marvel also garnered two other nominations for the movie in the Best Original Song category for All The Stars (Kendrick Lamar and SZA) and for Best Original Score (Ludwig Goransson). That's also particularly important as it's very rare that a movie can go on to win Best Picture if it wasn't also nominated in other major categories, such as directing, screenplay or the acting categories. Though, it does happen from time to time. Spider-Man: Into the Spider-Verse, which has yet to be released but has been praised by critics thus far, currently boasting a 100 percent approval rating on Rotten Tomatoes, also came up big. The movie earned a nomination in the Best Motion Picture - Animated category, alongside Isle of Dogs, Mirai, Ralph Breaks the Internet: Wreck-It Ralph 2 and Incredibles 2. While this was made by Sony and not Marvel Studios, it's still great for the brand. And since Miles Morales is front-and-center in the animated feature, it's a great moment for fans of the character. This all shows that Hollywood is indeed taking comic book movies much more seriously these days. While Black Panther certainly seems deserving, given that it was critically heralded, grossed $1.3 billion at the box office, had a deeper message than good vs evil and was a major showcase for diversity, there are other comic book adaptations that have felt equally deserving. The most prominent example being Christopher Nolan's The Dark Knight, which didn't wind up scoring a Best Picture nomination that year. Logan and Wonder Woman were also viewed as major snubs last year. It's worth mentioning that Deadpool actually scored a Best Motion Picture - Musical or Comedy nomination, but this is the first time a movie has made it into the drama field. It's also important to remember as the Oscars approach that the Golden Globes and Academy Awards are voted on in entirely different ways. But this is a good indicator of Black Panther's chances come time for the Oscar nominations. And maybe Spidey will finally get some awards season recognition. The 2019 Golden Globes ceremony, which will be hosted by Andy Samberg and Sandra Oh, is set to take place on Sunday, January 6.